Miami, Florida (CNN) -- The sign reads, "Always stay at least 15 feet away from alligators." That rule is difficult not to break when you go to the Shark Valley Visitor Center in the Florida Everglades. Just 35 miles from Miami and 70 miles from Naples, Shark Valley is worth packing up your beach chair for the day in search of Florida wildlife. Jim and Jen Delproposto traveled to Miami from Michigan for a wedding and decided to visit the Everglades. Their expectations were low. "We expected to see marsh," said Jim Delproposto. "I certainly didn't expect to see alligators everywhere," said his wife, Jen. "I can't get over how close by they are," she said as the couple posed for a picture in front of an alligator. The name Shark Valley comes from the area in the Gulf of Mexico known as Shark River, where the water in the Everglades flows, according to Park Ranger Maria Thomson. Despite the name, you won't find any sharks here, but it would be difficult not to see an alligator. The Delpropostos spotted at least 25 alligators within the first three miles of the Shark Valley Loop, a paved 15-mile path. The alligators are often found next to the path sunning themselves on the grassy bank. You can walk the loop as the Delpropostos did or ride a bicycle on the path. If you don't bring your own, the visitor center rents bikes for $7 an hour. The other option for venturing into the park is a two-hour tram tour narrated by park rangers. The tram stops at an observation tower 7 miles down the path from the visitor center, where you get a stunning view of the "river of grass," which the Everglades is commonly called. The birds are bountiful and lucky visitors may spot deer or a Florida otter. The tram tour is $16.25 for adults and $10.00 for children. There's also a $10 per vehicle fee to enter the park. You can make reservations for the tram by calling the Shark Valley Visitor Center. Whether on foot, bicycle or tram, you get so close to the alligators that your heart may start to beat fast and your hands may start to sweat. You may have to avoid an alligator tail sprawled across the path. 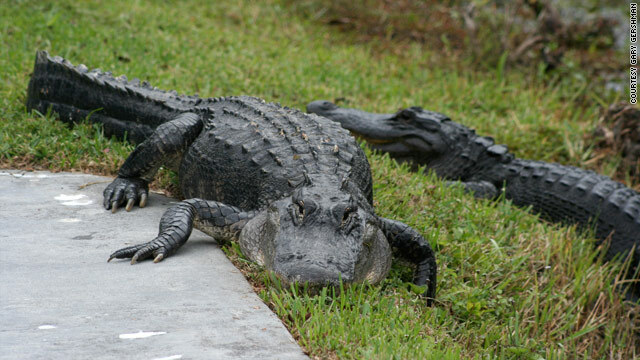 "They are very used to people cycling around them," says Linda Friar, a spokesperson for the Everglades National Park. "The Everglades never had a significant human-alligator interaction," she adds. Friar says the alligators in the park have a large amount of habitat with an abundance of prey, so they will not go after a human unless they feel threatened. Keeping your distance is one way to stay safe, but until the alligators adhere you may find yourself unintentionally violating the 15-foot rule.